KE00079 is a solid phase sandwich Enzyme Linked-Immuno-Sorbent Assay (Sandwich ELISA). 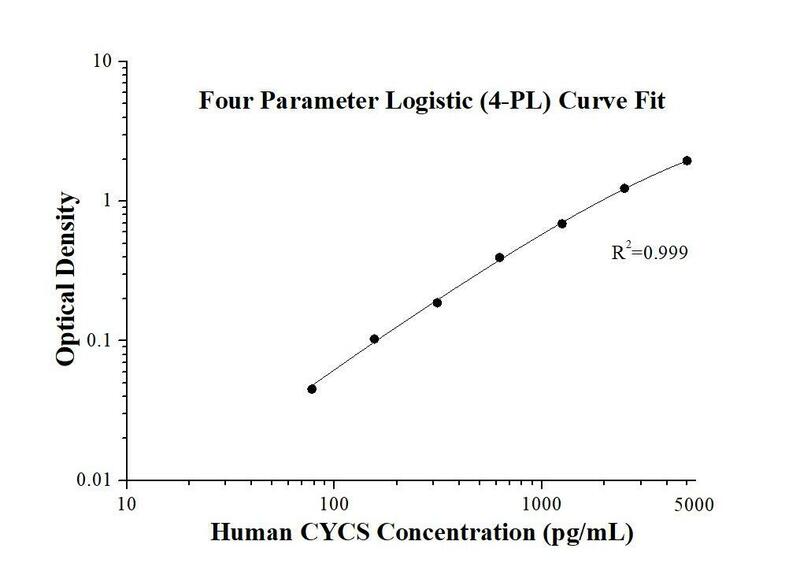 The CYCS ELISA kit is to be used to detect and quantify protein levels of endogenous CYCS. The assay recognizes human CYCS. A polyclonal antibody specific for CYCS has been pre-coated onto the microwells. The CYCS protein in samples is captured by the coated antibody after incubation. Following extensive washing, a monoclonal antibody specific for CYCS is added to detect the captured CYCS protein. For signal development, horseradish peroxidase (HRP)-conjugated antibody is added, followed by Tetramethyl-benzidine (TMB) reagent. Solution containing sulfuric acid is used to stop color development and the color intensity which is proportional to the quantity of bound protein is measurable at 450nm with the correction wavelength set at 630 nm. CYCS, Cytochrome c is a 12-15 kDa electron transporting protein located in the inner mitochondrial membrane. Upon apoptotic stimulation, cytochrome c can be released from mitochondria into cytoplasm, resulting in caspase-3 activation and apoptosis. Measurement of cytochrome c release from the mitochondria is useful for detection of the onset of apoptosis in cells. In addition, cytochrome c can also leave cells and be detectable in extra-cellular medium of apoptotic cells and serum of cancer patients. The level of serum cytochrome c may serve as a prognostic maker during cancer therapy. This kit is designed to quantify the level of cytochrome c protein.